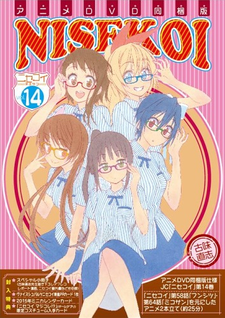 Bundled with the 14th, 16th, 17th and 21st volumes of the Nisekoi manga. Vol. 14's OVA adapts chapter 58 "Funshitsu" and chapter 64 "Mikosan." Vol. 16's OVA adapts chapter 65 "Henbou" and chapter 71 "Oshigoto." Vol. 17's OVA adapts chapter 81 "Sentou" and chapter 105.5 "Service"
Vol. 21's OVAs adapts some of the "Magical Pâtissier" spinoff manga and the "Shinkon" manga bonuses.